When developer Paul Kolkmeyer looks at the former Oracle Charter School in Buffalo, he sees a boutique hotel and apartments. Kolkmeyer, head of Priam Development, wants to convert the Goodyear House at 888 Delaware Ave. – home of the former high school – into a combination of hotel and apartments, with 29 guest rooms and 20 market-rate units. Located near the intersection of Delaware and Bryant Street, that would put the new hospitality and housing project next to the International Institute of Buffalo and just below the former Women's and Children's Hospital of Buffalo campus that Nick Sinatra and William Paladino are redeveloping into Elmwood Crossing. Plans for the 64,538-square-foot building call for the hotel units to be located mostly in the former mansion, while apartments would be in the classroom and gymnasium wing, along with the second floor of the historic carriage house. The independent, boutique hotel will likely be called the Goodyear Inn, Kolkmeyer said. The site currently has 43 parking spaces, which Kolkmeyer said would likely be reserved for the apartment residents. For hotel guests, he's working to secure potential off-site valet parking nearby, so that guests would be able to drop off their cars at the hotel entrance and request them when needed. "That's the same thing that happens at a lot of the hotels downtown here now," he said. The building would also include a small fitness center and laundry facilities for residents, while the hotel guests will have a small kitchen and serving area for continental breakfasts, light lunch and cocktails, but not a full restaurant. The apartments, which will range from 500 to 1,100 square feet, will be aimed at "middle-market" renters, so they won't be "exorbitantly priced," he added. He compared them to the 23 micro-units he just completed at Campion Hall, near Canisius College, which average about 450 square feet and are fully occupied. "These things will be very comparable to that," Kolkmeyer said. "We're not putting something high-end in there." The $11.4 million project is complicated by the historic nature of the building and by Buffalo's Green Code, according to a letter from project architect Matthew W. Meier of HHL Architects, who wrote that "compliance with various items" will be challenging since the financing includes historic tax credits. "Most of the existing site will remain as is," Meier wrote, except that the loading dock in the front will be removed and its parking area turned into a lawn. A one-way driveway and concrete sidewalk will be added, along with a handicapped-accessible entrance. The project went before the Planning Board on Monday for a public hearing and consideration of a special-use permit, which must also go to the Common Council. Their verdict: Kolkmeyer first has to get an agreement in place – and submitted to the city – to ensure he has off-site valet parking for hotel guests. Kolkmeyer said he hasn't yet closed on the property, which is still owned by the now-defunct charter school, but he's also contemplating a tax-free exchange by selling another building. He said he hopes to complete the transaction in June, but still expects several months of delays while waiting for approvals from the State Historic Preservation Office and National Park Service to qualify for historic tax credits. His goal is to start work by the fourth quarter, followed by about 12 months of construction before opening by the end of 2020. Designed by Green & Wicks and built in 1902 at a cost of $500,000 – now more than $14.7 million – the Goodyear House is a two-and-a-half-story brick and stone mansion constructed in the Beaux Arts and French Renaissance styles, for Charles R. and Ella Goodyear. The house features a mansard roof, a row of dormers topped with pediments running along the roofline, and a large arched doorway at the main entrance. It was built with five levels and 11 bedrooms, including a basement and attic and two bedroom floors, as well as a spiral staircase with a wrought-iron balustrade and an oak handrail. Goodyear was a founder and head of several firms, including the Buffalo and Susquehanna Railroad, Great Southern Lumber Co. and the New Orleans Great Northern Railroad Co., and was also a director of Marine National Bank and General Railway Signal. Among other guests at the house were the king, queen and prince of Belgium in 1919. 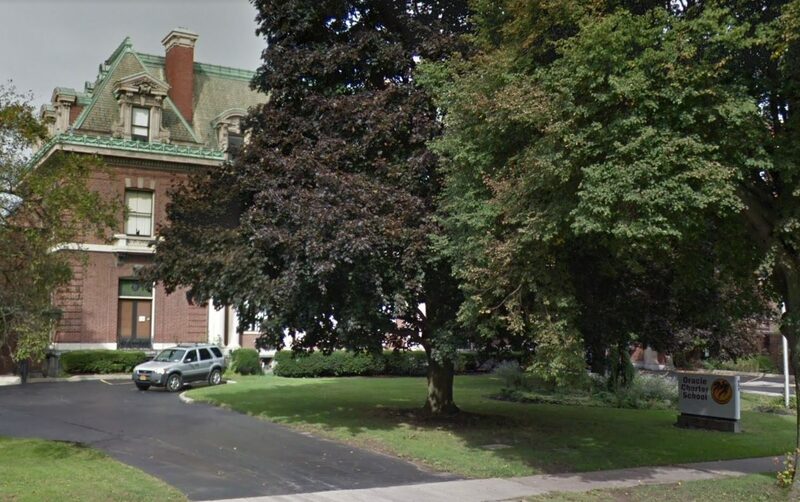 The home was sold in 1940, after Ella Goodyear's death, to a predecessor of BlueCross BlueShield of Western New York, and then to the Catholic Diocese of Buffalo, which converted it into the Bishop McMahon High School, renovating the 11 bedrooms, den, living room, solarium, billiard room and dining room into classrooms. The bathrooms became locker rooms.